Spending the weekend next to the water in the Breede River Valley between Worcester and Robertson with my beautiful wife and great friends is certainly my idea of an idyllic breakaway. An occasion like this is rare and deserves only the best bank side meal a chef can conjure up. And being South African, we all have an imprinted love for potjiekos. So, I didn't have to seek far for ideas to treat our taste buds while enjoying the picturesque sunset and the sound of slow flowing water whispering in our ears. I would love to share this lamb shin potjie recipe to cook and enjoy in the company of your friends and family, lazing around a late afternoon campfire. Heat your pot over a medium fire and add the cooking oil. Once warmed sufficiently, add the lamb shins and fry until the meat has browned. Remove the browned lamb from the pot. In the excess fat and oil left over from the lamb, fry the onion and carrots together over a slow heat until the onions are soft and transparent. Add one tablespoon of flour and mix through well to form a roux, which will help thicken your sauce. Deglaze the pot with your choice of brew – make sure to scrape all the caramelised goodness from the bottom of the pot. Dilute the chicken stock cubes in 1.5L of water and add to the pot. Once back on the boil, add the braised lamb shins and the Coca-Cola. After a proper stir, close the lid and cook over low fire for 60 to 90 minutes. Check your lamb to ensure the meat is soft and tender. Season with salt and freshly ground pepper, and top with your selection of vegetables. Cook covered for approximately another 30 minutes until the veggies are nice and soft. 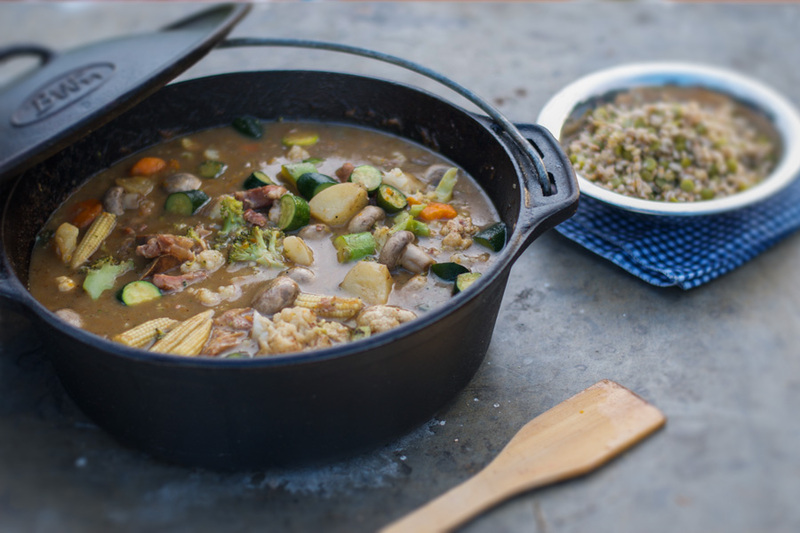 Serve your potjie with mealie rice or soft cooked barley to compliment flavours extracted from your choice of brew. Coca-Cola helps to tenderise the meat and significantly shortens the cooking time. Always season a stew or potjie closer to the end of the cooking time to ensure your dish is not too salty once the sauce has reduced and thickened. Feel free to share your favourite recipes with us by emailing us at info@carpfever.co.za or leave a comment below.